New Arrivals from Quilt Market! 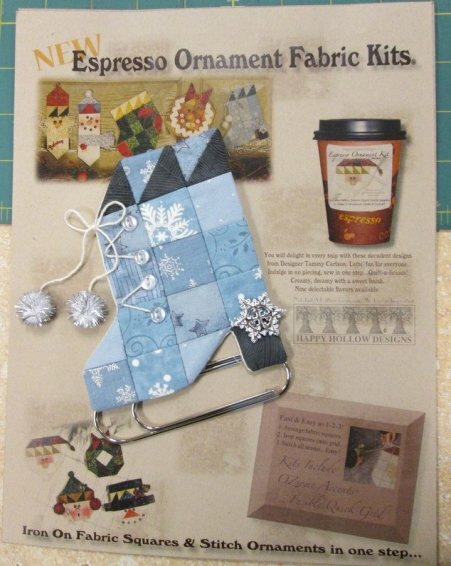 Did you know that our very own Geralyn Powers has her own Quilting book coming out on September 11, 2013? We are getting the party balloons ready to share this well deserved event with YOU! We will let you know as soon as we know the exact date! Isn't this so exciting! The Celebration of our Country is coming up..... Get a head start on sharing the Celebration. 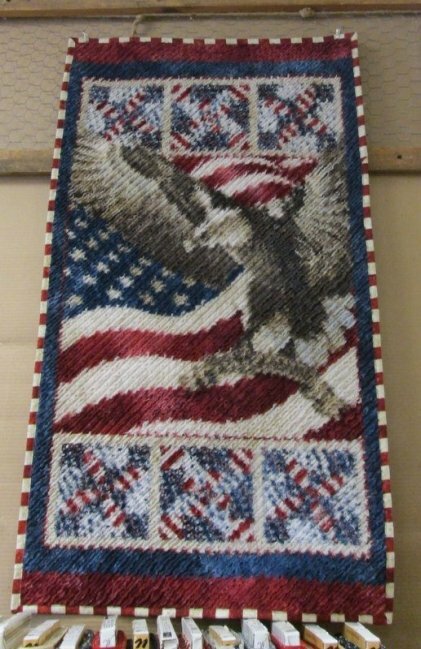 We have an eagle panel that can be made for Quilts of Valor or as the center of a quilt. It is just as beautiful as a wallhanging and we chose to make a chenille wallhanging. The possiblities are endless.. 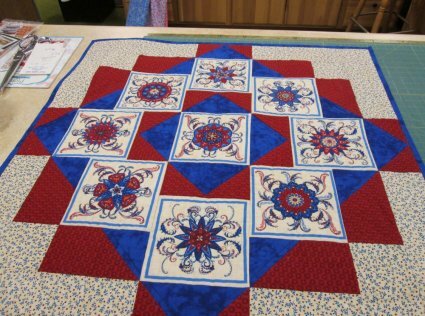 There are also some beautiful patriotic colors to make this wallhanging using the smaller pattern of "Circle of Nine". 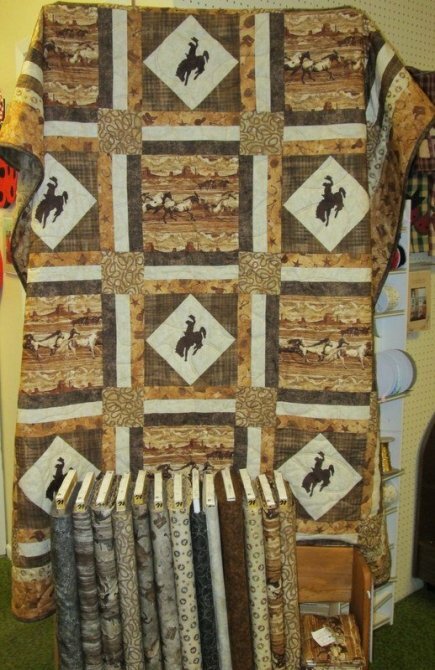 This beautiful Wyoming Cowboy Quilt is so simple to put together and a favorite to make. 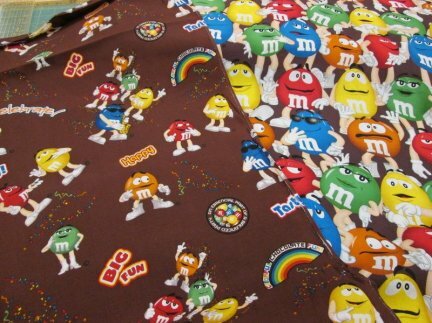 Isn't this M&M fabric look so fun? You can enjoy your M&M's each day without putting on those vicious pounds! 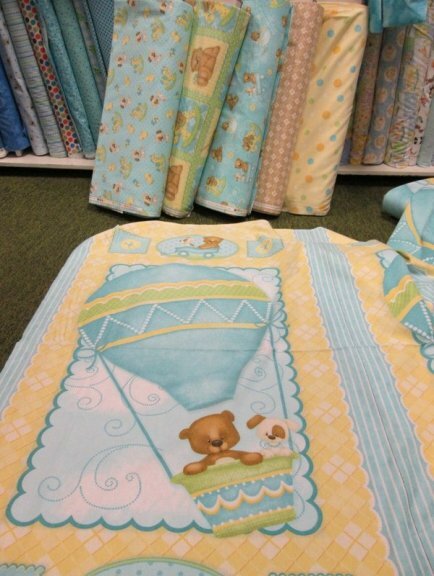 We have the cutest Bear Hugs Flannel for that new baby or toddler. There is 1 panel piece along with 5 coordinating pieces. Great for a boy or girl. 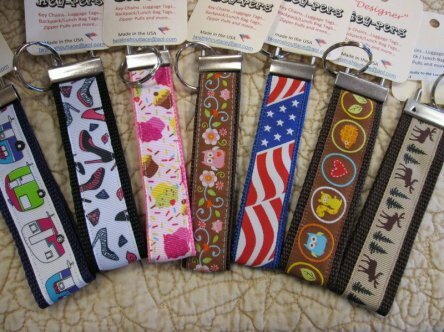 JUST IN...... You can use them as a key chain, luggage tag, backpack, lunch bag tags, zipper pulls and so much more! You won't be able to buy just 1! There is even more to choose from! Need something for your daughter to do this summer? Come pick up these really cute "All Dressed Up" jewelry kits. 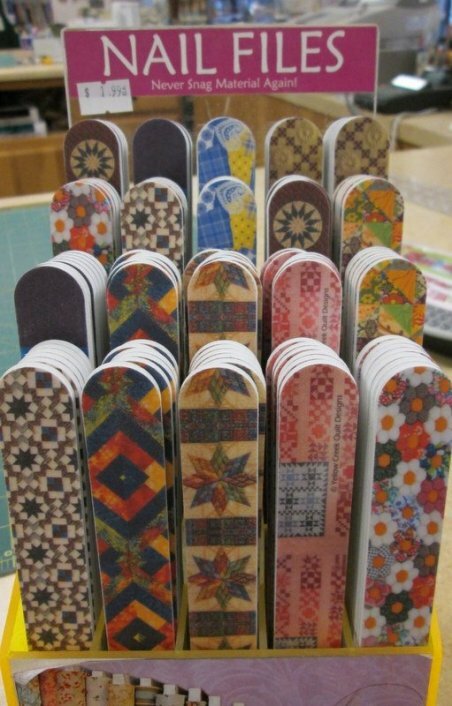 We have new Nail Files for yourself and it is a great gift to give to someone to show you are thinking of them. "you can file away your troubles." Aren't these just the cutest kits? They even come with your own coffee or hot chocolate cup! 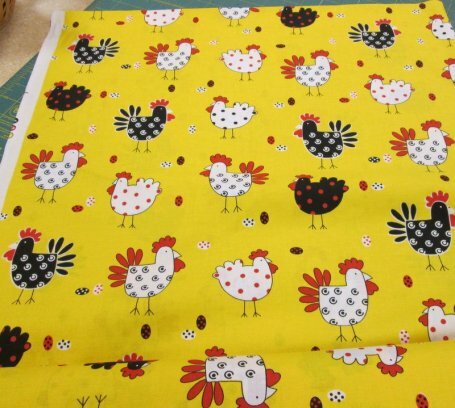 Isn't this chicken fabric so fun? What a cute idea for a pillowcase! Is your husband planning his hunting trip? Well, get some friends together and plan your QUILTING RETREAT! Have dinner, yummy snacks and lots of fun! Give us a call and schedule a girls day!